A human rights group has raised alarm bells over the psycho-physical torture tactics perpetrated against Palestinian detainees in Israeli dungeons. 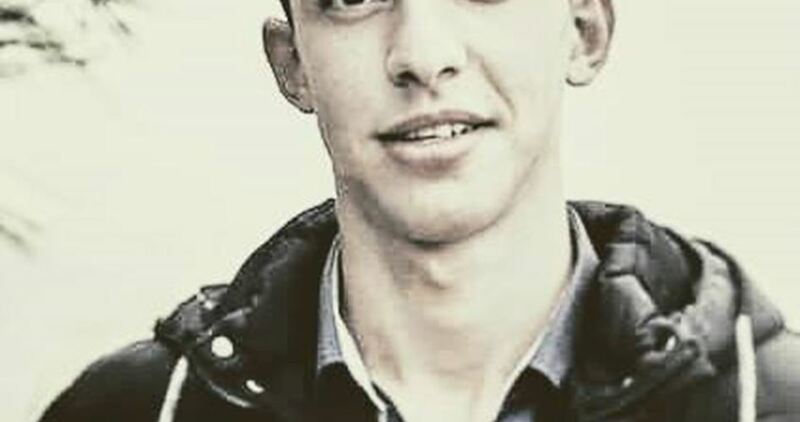 Lawyer Ma’moun al-Hasheem, from the Palestinian Prisoner’s Society (PPS), quoted 21-year-old prisoner Wesam Rabii, held in al-Mascoubiya detention center, as stating that he has been made to endure harsh torture at the hands of the Israeli investigators. Rabii spoke out against the long and exhausting investigation procedures, which lasted for 48 hours during the first days of his detention. As a result, the detainee has spent sleepless nights. Rabii added that he has been subjected to heavy beating while being handcuffed. The Lawyer further quoted Rabii as stating that he had undergone a mental breakdown and was transferred to an isolated cell. He had also been forced to lie on the ground while being chained hand and feet for over five hours. Rabii had gone through a two-day hunger strike to protest such abject detention conditions. Rabii was kidnapped by the Israeli occupation forces on March 30, 2018. An Israeli court ruled for extending his remand for three times. A fourth hearing is expected to be held on Monday to decide on his case. PPS said at least three Palestinian detainees have been subjected to preplanned torture in al-Mascoubiya custody since March. The list included Omar al-Kiswani, Yahya Alawi, and Wesam Rabii. 90% of Palestinians incarcerated in Israeli lock-ups have been enduring psycho-physical torture during the detention and investigation phases. Israeli forces continued with systematic crimes in the occupied Palestinian territory (oPt) for the week of 12 – 18 April, 2018. Israeli forces continued to directly target peaceful protests that did not pose any threat to the Israeli soldiers’ life. 2 Palestinian civilians were killed, in the Gaza Strip. 393 Palestinian civilians, including 67 children, 10 women, 4 journalists and 3 paramedics, were wounded in the Gaza Strip. 17 Palestinian civilians, including 3 children, were wounded in the Gaza Strip. Israeli forces continued to use excessive lethal force against Palestinian civilians, who participated in peaceful demonstrations organized on the 42nd anniversary of the Earth Day, particularly in the Gaza Strip, which witnessed peaceful demonstrations along the eastern Gaza Strip border area, where ten thousands of defenseless Palestinian young men, women, children, and elderlies participated. On 13 April 2018, the Gaza Strip witnessed peaceful demonstrations where ten thousands of Palestinian civilians participated. Those non-violent demonstrations continued sporadically during the reporting period. As a result, 2 Palestinian civilians were killed, so the death toll has increased to 29 Palestinian civilians, including 3 children and a journalist, since the beginning of the demonstrations in the Gaza Strip only on 30 March 2018. Moreover, during the reporting period, 393 Palestinian civilians, including 67 children, 10 women, 4 journalists and 3 paramedics were wounded; 20 of them sustained serious wounds. In the West Bank, the Israeli forces wounded 17 Palestinian civilians, including 3 children, in separate incidents. Though the number of victims killed this week decreased, dozens of Israeli snipers stationed behind sand barriers and hills and military jeeps along the border fence in the eastern Gaza Strip deliberately and selectively opened fire but more lightly than the previous times at the participants in the peaceful demonstrations that included dozen thousands of civilians in 5 areas in the eastern Gaza Strip. The demonstrations were as always fully peaceful, and PCHR’s fieldworkers did not witness weapons or even armed persons dressed in civilian clothes among the demonstrators, who were thousands of elderlies, women, children and entire families raising flags, chanting slogans and national songs and flying kites. The demonstrators also set fire to tires and burned the Israeli flags while in other demonstrations there were folklore and sports performances. However, they were targeted by the Israeli forces. Again, there was no threat to the soldiers’ life and no Israeli soldier has so far been wounded. Though few numbers of demonstrators approached the border fence and attempted to throw stones, they did not pose any threat or danger to the life of Israeli soldiers who were stationed behind sand barriers that are around 50-100 meters away from the fence. During this week, the Israeli forces widely used bursts of tear gas canisters targeting the center of the demonstrations and beyond away from the demonstrators near the border fence. As a result, many civilians suffered tear gas inhalation and seizures; some of them were transferred to hospitals. The Israeli forces targeted with 10 gas canisters the field hospital and a medical tent belonging to the Algerian Society in Khuza’ah and its vicinity, noting that both are 800 meters away from the border fence. Moroever, the ambulance crews were targeted in Rafah and al-Bureij refugee camp. This proves that the Israeli forces deliberately and explicitly target and obstruct the work of medical crews for the first time since the beginning of the incidents. As a result, dozen members of medical crews suffered tear gas inhalation while 4 paramedics were shot with bullets and directly hit with tear gas canisters. The Israeli forces again directly targeted the press crews. As a result, Ahmed Mohammed Hasan Ashraf Abu Hasan (24) was hit a bullet to his left underarm while he was covering the demonstration in eastern Jabalia and wearing his Press-marked vest and helmet. His injury was classified serious. Moreover, 2 journalists were hit with live bullets and tear gas canisters in Rafah, and a journalist was wounded in Eastern Khan Younis. PCHR’s investigations indicate also that those two killed during this week were hit one with a bullet to the chest and the other to the back. According to medical sources in the Gaza Strip hospitals when dealing with the injuries, many were hit with live bullets, causing large tissue lacerations and big holes in the injured part, indicating the bullets used are explosive live bullets. As part of targeting the border areas, Israeli forces stationed along the border fence between the Gaza Strip and Israel, east of Deir al-Balah, al-Maghazi and al-Bureij in the central Gaza Strip, opened fire at the Palestinian farers and shepherds on 14, 15, 16, 17 and 18 April 2018 in addition to targeting a checkpoint belonging to the Palestinian Armed Groups. However, no casualties were reported. On 18 April 2018, Israeli tanks fired 6 artillery shells and heavily opened fire at a group of young men who were tens meters away from the border fence between the Gaza Strip and Israel towards the agricultural lands and a border control point, east of Khuza’ah, east of Khan Younis. As a result, 5 young men were wounded; one of them in serious condition. The shelling also caused damage to a house sheltering a family of 6 members. As part of targeting fishermen in the sea, the Israeli forces continued to escalate their attacks against fishermen in the Gaza Sea, indicating to the on-going Israeli policy of targeting their livelihoods. During the reporting period, PCHR’s fieldworkers monitored 10 shooting incidents; 3 in north-western Beit Lahia and 7 in Western Soudaniyah, west of Jabalia in the northern Gaza Strip. In the West Bank, on 12 April 2018, two Palestinian civilians were wounded when Israeli forces moved into Shaqba village, west of Ramallah, to level civil facilities. A number of residents gathered in the place, so the Israeli forces fired tear gas canisters and rubber bullets at them. As a result, 2 of them were hit with rubber bullets to their feet. In addition to the abovementioned injuries, during the reporting period, 15 Palestinian civilians, including 3 children, were wounded after Israeli forces opened fire at them and fired tear gas canisters directly during peaceful protests and stone-throwing at the Israeli soldiers stationed at the entrances to the Palestinian communities in the West Bank. Those demonstrations came in the light of demonstrations organized by Palestinian civilians in protest at Trump’s decision to recognize Jerusalem as the capital of Israel, the Israeli forces’ ongoing settlement crimes, confiscation of Palestinian lands, and Israeli forces’ crimes against the peaceful demonsrtations organized by the Palestinians along the eastern borders of the Gaza Strip. During the reporting period, Israeli forces conducted at least 78 military incursions into Palestinian communities in the West Bank and 5 similar ones into Jerusalem and its suburbs. During those incursions, Israeli forces arrested at least 59 Palestinians, including 6 children, in the West Bank. 19 civilians, including 4 children and a woman, were arrested in Jerusalem and its suburbs. Among those arrested during the reporting period was Sheikh Jamal al-Tawil, a political leader in Hamas Movement in the West Bank and former prisoner who served 17 years in the Israeli jails. In the Gaza Strip, on 16 April 2018, Israeli forces moved 70 meters into the eastern side of the al-Fukhari village, southeast of Kahn Younis in the southern Gaza Strip. They leveled along the border fence and repaired the second fence along the Gaza Strip. On 17 April 2108, the Israeli forces moved 70 meters into eastern Khuza’ah village, east of Khan Younis in the southern Gaza Strip. They leveled lands in the border area and repaired the second fence in front of the Return Camp established since 30 March 2018. As part of demolition of civil objects, on 12 April 2018, the Israeli forces demolished a number of facilities in “Khelet Motawe’a” area, north of Shaqba village, west of Ramallah. The demolished facilities were 3 agricutural rooms, 600-meter concrete fences, stone chains and a mobile house (caravan.) The demolition came on grounds of building in Area C classified according to Oslo Accords. The area on which those facilities were established is 3 kilometers away from ” Ofarim” settlement, 2 kilometers away from the annexation wall and 1 kilometers from the settlement Road 446. On 16 April 2018, Israeli forces accompanied with a staff from the Construction and Organization Department in the Civil Administration moved into Kherbet Zanoutah, west of al-Thaheriyah village, south of Hebron. The Department officers started demolishing and confiscating the tents established again after being dismantled and confiscated on 09 April 2018. As part of the Israeli settlers’ attacks against Palestinian civilians and property, on 13 April 2018, a group of settlers set fire to al-Sheikh Sa’adah Mosque, west of ‘Aqrabah village, southeast of Nablus. The settlers poured a flammable material at the mosque entrance and lit it. As a result, the entrance and 3 water coolers caught fire before some residents rushed to the mosque to extinguish it. On the same day, a group of settles from “Itmar” settlement damaged 7 olive trees in Khelet Rajeh, northeast of Rojib village, east of Nablus, and destroyed a water well and retaining wall surrounding the land in addition to damaging the fence. On 14 March 2018, Israeli settlers from “Havant Maoun” settlement established on Palestinian lands in eastern Yata, south of Hebron, attacked with stones houses in Kherbet al-Towanah. On 17 April 2018, settlers attacked al-Laban al-Shariqyah village, south of Nablus, and the Palestinian vehicles parked in front of the owners’ houses, in the house yards and on the village streets. The settlers wrote slogans against Arabs and Muslims and on the houses’ walls and cars in addition to puncturing the tires of 26 cars. On the same day, the Israeli settlers attacked the nearby al-Sawiyah village and the Palestinian vehicles in it. The settlers also wrote slogans against Arabs and Muslims and on the houses’ walls and cars in addition to puncturing the tires of 26 other cars. At approximately 17:45 on Thursday, 12 April 2018, Israeli forces stationed behind the border fence between the Gaza Strip and Israel into the east and northeast of the demonstration yard, east of Khuza’ah, east of Khan Yunis in the southern Gaza Strip, fired live bullets at a group of Palestinian protestors who were in the northeast of the demonstration camp as some of them attempted to approach the border fence. As a result, Abdullah Mohammed Abdullah al-Shahri (28), from Khan Yunis, was hit with a live bullet to the chest. He was transferred via a civilian car to Gaza European Hospital in the city and doctors classified hi injury as serious. At approximately 19:00 on the same day, medical sources announced that Abdullah succumbed to his wounds. Since early morning on Friday, 13 April 2017, hundreds of civilians, including women and children within entire families started swarming to the demonstration camp established by the Supreme National Authority for the Great March of Return and Breaking Siege, east of Khuza’ah, east of Khan Yunis. The camp is surrounded from the eastern and northern sides with the border fence between the Gaza Strip and Israel at distances averaged between 250 and 500. At approximately 01:30 following the end of Friday Prayer, the number of participants increased in the demonstration yards and outside it reaching to hundred thousands of men, elderlies, women and children. They deployed inside and outside the camps yards, raised flags, and chanted slogans and folk songs, while only a few numbers of them attempted to approach the border fence, set fire to tires, burned the Israeli flags and threw stones at the Israeli forces. A few number of the protestors approached the first security fence established inside the Palestinian lands, 70-50 meters away from the main border fence. According to observations conducted by PCHR’s fieldworker, Israeli snipers stationed behind sand barriers and military vehicles, 30-50 meters behind the border fence and sporadically opened fire at the protestors’ gatherings. The demonstrations were as always fully peaceful, and PCHR’s fieldworkers did not witness weapons or even armed persons dressed in civilian clothes among the demonstrators, who were thousands of elderlies, women, children and entire families raising flags, chanting slogans and national songs and flying kites. The demonstrators also set fire to tires and burned the Israeli flags. However, the Israeli forces widely used bursts of tear gas canisters targeting the center of the demonstrations and beyond away from the demonstrators near the border fence. As a result, many civilians suffered tear gas inhalation and seizures ; some of them were transferred to hospitals. The Israeli forces targeted with 10 gas canisters the field hospital and a medical tent belonging to the Algerian Society in Khuza’ah and its vicinity, noting that both are 800 meters away from the border fence. This proves that the Israeli forces deliberately and explicitly target and obstruct the work of medical crews for the first time since the beginning of the incidents. The Israeli forces again directly targeted the press crews that were standing in a high area near the field hospital, east of Khuza’ah. The shooting continued until approximately 20:00 on the same day evening. As a result, 67 civilians, including 10 children, 3 women and a journalist, were wounded. Thirty three of them were hit with live bullets; 32 were directly hit with tear gas canisters and 2 civilians were hit with rubber bullets. The wounded civilians were taken to field hospitals in the camp and then transferred of Nasser and Gaza European and Algerian Hospitals in the city. Doctors classified the injury of 3 civilians as serious. At approximately 08:00 on the same Friday, ten thousands of civilians, including women and children, within entire families participated in the “Great March of Return” established by the Supreme National Authority for the Great March of Return and Breaking Siege, east of Malakah intersection, east of al-Zaitoun neighborhood, east of Gaza City. The activates included raising Palestinian flags, burning Israeli flags, chanting slogans and national songs, setting fire to tires and flying kites. Despite that were as always fully peaceful, Israeli forces stationed behind the border fence between the Gaza Strip and Israel deliberately and randomly fired live and rubber bullets and tear gas canisters at the protestors. As a result, Islam Mahmoud Rushdi Herzallah (27) from al-Sheja’eya neighborhood was killed after being hit with a bullet that entered his back and exited the chest. Moreover, 137 civilians, including 20 children and 5 women, were wounded. One hundred and four of them were hit with live bullets, 5 were hit with rubber bullets and 28 were directly hit with tear gas canisters. They were transferred to al-Shifa and al-Quds Hospitals in Gaza City. Doctors classified the injury of 5 civilians as serious. Journalist Ahmed Mohammed Abu ‘Amrah (28) was hit with 2 live bullets to the thighs. Journalist Mo’ath Fathi al-Hams (22) was hit with a rubber bullet to the left leg and a tear gas canister. Paramedic Ashraf Mousa Jom’ah al-Wawi (38) was hit with a live bullet to the right leg. In addition, hundreds, including paramedics and journalists, suffered tear gas inhalation and seizures after the Israeli forces stationed along the border fence heavily fired tear gas canisters. At approximately 14:00 on the same Friday, Palestinian protestors amounted to thousands began swarming to camps established by the Supreme National Authority for the Great March of Return and Breaking Siege 350 meters away from the border fence between the Gaza Strip and Israel, east of al-Buraij in the central Gaza Strip. A number of young men approached the border fence, set fire to tires and threw stones at Israeli soldiers stationed behind sand barriers along the border fence. The soldiers fired live and rubber bullets and tear gas canisters at the protestors. The clashes, which continued until the evening hours, resulted in the injury of 53 civilians, including 13 children, and doctors classified the injury of 2civilians as serious. Due to Israeli excessive firing of tear gas canisters at areas where the ambulance cars were present on Jaker Street, 300 meters away from the border fence, 29 civilians, including 10 PRCS ambulance officers suffered tear gas inhalation and doctors classified the injury of 2 of them as serious and were transferred to al-Shifa Hospital in Gaza City, while the others’ injuries were classified between moderate as minor. At approximately 13:00 on Saturday, 14 April 2018, dozens of Palestinian civilians gathered into the east of Malakah intersection, east of al-Zaitoun neighborhood east of Gaza City, to participate in the activities of “Great March of Return and Breaking the Siege.” The protestors threw stones at Israeli forces stationed behind the border fence between the Gaza Strip and Israel. The soldiers fired live bullets, rubber-coated metal bullets and tear gas canisters at them. As a result, 3 civilians, including a child and a woman, were wounded. At approximately 19:30 on the same Saturday, Israeli forces stationed behind the border fence between the Gaza Strip and Israel, north and northeast of the demonstration yard, east of Khuza’ah village, east of Khan Yunis in the southern Gaza Strip, fired live bullets at a group of protestors who were present in the northeast of the demonstration camp. Some of the civilians attempted to approach the security fence. As a result, a 16-year-old child was hit with a live bullet to the right hand. He was transferred to Gaza European Hospital and doctors classified his injury as minor. 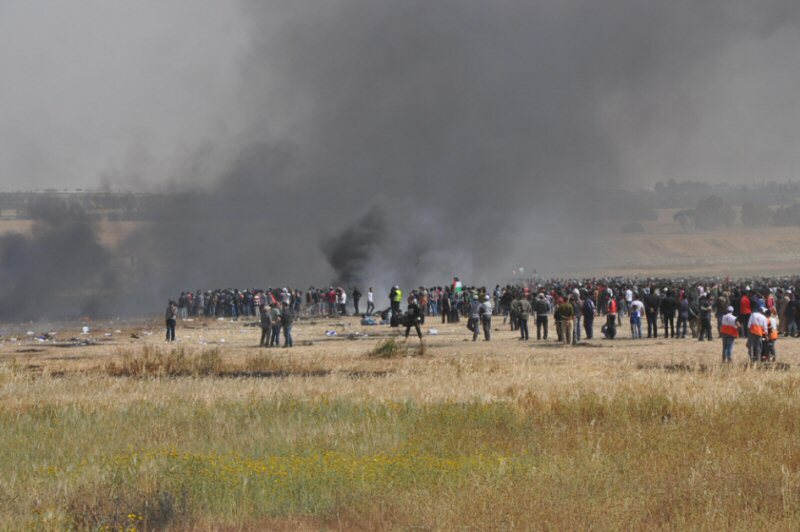 At approximately 13:00 Sunday afternoon, 15 April 2018, dozens of Palestinian civilians gathered into east of Malakah intersection, east of al-Zaitoun neighborhood, east of Gaza City, to participate in the activities of “Great March of Return and Breaking the Siege.” The protestors threw stones at Israeli forces stationed behind the border fence between the Gaza Strip and Israel. The soldiers fired live bullets, rubber-coated metal bullets and tear gas canisters at them. As a result, a civilians from al-Sheja’eya neighborhood was hit with a live bullet to the chest. He was transferred to al-Shifa Hospital in Gaza City. doctors classified his injury as serious as he is staying at the ICU. At approximately 16:30 on the same Sunday, Israeli forces stationed behind a sand barrier, 50 meters into the east of the border fence between the Gaza Strip and Israel, east of Abu Safiya Hill, northeast of Jabalia in the northern Gaza Strip, fired live and rubber bullets and tear gas canisters at dozens of civilians who were about 50 to 150 meters into the west of the abovementioned border fence. As a result, a 24-year-old civilian was hit with a live bullet to the left leg. At approximately 17:00 on the same Sunday, Israeli forces stationed behind the border fence between the Gaza Strip and Israel, north and northeast of the demonstration camp, east of Khuza’ah village, east of Khan Yunis in the southern Gaza Strip, fired live bullets and tear gas canisters at protestors who were in the northeast of demonstration camp. Some of the protestors attempted to approach the border fence. The shooting continued sporadically for 2 hours. As a result, a civilian was hit with a live bullet to the right leg. He was transferred to Gaza European Hospital and doctors classified his injury as moderate. At approximately 14:00 on Tuesday, 17 April 2018, dozens of Palestinian civilians gathered at the east of Malakah intersection, east of al-Zaitoun neighborhood, east of Gaza City to participate in “The Great March of Return and Breaking the Siege” activities. They threw stones at Israeli soldiers stationed behind the border fence between the Gaza Strip and Israel. The soldier soldiers fired live bullets, rubber-coated metal bullets and tear gas canisters at them. As a result, 5 civilians, including 2 children, were wounded. They were transferred to al-Shifa Hospital in Gaza City to receive medical treatment. At approximately 16:00 on the same Tuesday, hundreds of protestors started swarming to the Return camps, east of al-Buraij in the central Gaza Strip to participate in “Great March of Return” activities established by the Supreme National Authority for the Great March of Return and Breaking Siege in the Gaza Strip to commemorate the Land Day activity. Dozens of the children and young men gathered near the border fence between the Gaza Strip as a few number of them approached the barbed wire and threw stones at Israeli soldiers stationed behind sand barriers along the border fence. The soldiers fired live bullets and tear gas canisters at them. the clashes, which continued until the evening hours, resulted in the injury of 2 children, both of them from al-Nuseirat. They were taken via a PRCS ambulance to al-Aqsa Hospital in Deir al-Balah. Doctors classified the injury of one of the children as serious and he was transferred to al-Shifa Hospital in Gaza City, while the other child’s injury was classified as minor. At approximately 18:30 on the same Tuesday, Israeli forces stationed behind the border fence between the Gaza Strip, north and northeast of the demonstration camp, east of Khuza’ah village, east of Khan Yunis in the southern Gaza Strip, fired live bullets and tear gas canisters at a group of protestors who were in the northeast of the demonstration camp. Some of the protestors attempted to approach the border fence and pull the security fence newly established by the Israeli forces inside the Palestinian lands, 50-70 meters away from the main border fence. The shooting sporadically continued for an hour. As a result, 2 civilians, including a child, were hit with 2 live bullets to the lower limbs. They were transferred to Gaza European Hospital and doctors classified their injury as moderate. At approximately 13:30 on Wednesday, 18 April 2018, dozens of Palestinian civilians gathered into the east of Malakah intersection, east of al-Zaitoun neighborhood, east of Gaza City, within their participation of “The Great March of Return and Breaking the Siege” activities. They threw stones at Israeli soldiers stationed behind the border fence between the Gaza Strip and Israel. The soldiers fired live bullets, rubber-coated metal bullets and tear gas canisters at them. As a result, 2 civilians were wounded. Following the Friday prayer on 13 April 2018, dozens of Palestinian civilians gathered in al-Mantarah area, east of Kufor Qalil village, south of Nablus, in protest against the Israeli crimes against Palestinian protestors at the eastern border of the Gaza Strip within the “Great March of Return and Breaking the Siege” activities. They set fire to tires and threw stones and at Israeli soldiers stationed behind sand barriers at al-Mantarah Hill. The soldiers fired live bullets and tear gas canisters at them. As a result, an 18-year-old civilian was hit with alive bullet shrapnel to the right hand. He was transferred to Rafidiya Hospital in Nablus to receive medical treatment. Around the same time, dozens of Palestinian protestors gathered near the Bridge of Madama village, which was closed by sand barriers on the abovementioned day, south of Nablus to secure a Marathoun for Israeli settlers on bypass Road to “Yitzhar” settlement. They set fire to tires and threw stones at Israeli soldiers who arrived at the area and stationed behind sand barriers. The soldiers fired live and rubber bullets and tear gas canisters at the protestors. As a result, a 21-year-old civilian was hit with 3 rubber bullets to the chest, shoulders and right hand finger . he was transferred to Rafidiya hospital in Nablus to receive medical treatment. Following the Friday prayer, dozens of Palestinian protestors gathered at the eastern entrance to al-Laban village, south of Nablus near the iron gate established by the Israeli forces at the village entrance branching from Ramallah-Nablus Street. The protestors set fire to tires and threw stones at Israeli soldiers who arrived at the area and stationed behind sand barriers. The soldiers fired live bullets and tear gas canisters at the protestors. As a result, a 38-year-old civilian was hit with a live bullet to the right foot. he was transferred to Yasser Arafat Hospital in Salfit to receive medical treatment. At approximately 15:00, a number of Palestinian young men gathered in al-Zawiyah Gate area in the center of Hebron. They threw stones and empty bottles at Israeli soldiers established at the closed entrance to Shuhada’a Street, and set fire to tires. A number of soldiers chased the soldiers between shops and fired sound bombs and tear gas canisters at them. Meanwhile, a number of soldiers set traps to the young men between the shops and then arrested Hamzah al-Qawasmah (20). Following the Friday prayer, dozens of Palestinian children and young men gathered at the northern entrance to al-Birah in protest against the Israeli forces crimes against Palestinian protestors at the eastern border of the Gaza Strip within the “Great March of Return and Breaking the Siege” activities at “al-Mahkamah” checkpoint near “Beit Eil” settlement, north of the city. The Israeli soldiers fired live and rubber bullets, sound bombs and tear gas canisters at the protestors. As a result, 5 civilians, including 2 children, were hit with rubber bullets to the lower limbs. The wounded civilians were transferred via a PRCS ambulance to Palestine Medical Complex in Ramallah to receive medical treatment. Doctors classified their injuries as moderate. At approximately 17:20 on Saturday, 14 April 2018, a group of Palestinian civilians moved from Kufor Qaddoum village, northeast of Qalqiliyah into the eastern entrance to the village, which has been closed for 15 years in favor of the entrance to “Kedumim” settlement established on the village lands. The protestors chanted national slogans demanding to end occupation, condemning the U.S President Donald Trump’s decision to recognize Jerusalem as the capital Israel and condemning the Israeli forces’ crimes against Palestinian protestors at the eastern border of the Gaza Strip within “The Great March of Return and Breaking the Siege” activities. The protestors threw stones at Israeli soldiers stationed behind sand barriers. The soldiers fired rubber bullets, sound bombs and tear gas canisters at them. As a result, a 17-year-old child was hit with a rubber bullet to the right foot. A 50-square-meter agricultural room comprised of a living room, bathroom, kitchen; concrete fences; and 2 stone chains belonging to Falah Yousef Mousa al-Masri. A 20-square-meter under-construction agricultural room built of bricks and roofed with concrete, concrete fences, a concrete-roofed bathroom built of bricks, a 50-square-meter agricultural room built of bricks and comprised of a living room, bathroom, kitchen, and concrete fences, in addition to confiscating a caravan. All the above mentioned property belongs to Mosbah Yousf Mousa al-Masri. Falah and Mosbah al-Masri said to PCHR’s fieldworker that the building was built a year ago and the demolition was carried out under the pretext of being in area classified as C, according to Oslo Accords. The area on which these facilities are located is about 3 kilometers away from Ofarim settlement, 2 kilometers from the annexation wall, and one kilometer from Settlement Road 446. He added that in January 2018, the Israeli Civil Administration hanged notices on the abovementioned building to stop the construction works. After that, Falah and Mosbah headed to al-Quds Center for Legal Assistance, where they submitted papers to get a license through a lawyer. They also appointed a surveyor and submitted a request to the Civil Administration to get a license, but they were surprised on the mentioned date that the Israeli forces moved into the area and carried out the demolition in addition to imposing a cordon on the area. The Israeli forces prevented any person from entering and exiting the area. Meanwhile, a number of Palestinian civilians gathered, so the Israeli forces fired tear gas canisters and rubber- coated metal bullets at them. As a result, 2 civilians were hit with rubber-coated metal bullets to the feet. At approximately 21:00 on Monday, 16 April 2018, Israeli forces accompanied with 2 military vehicles and a vehicle of Israeli Civil Administration moved into Khebit al-Zanotah, west of al-Dahiryia village, south of Hebron. The Israeli Civil Administration officers demolished and confiscated tents, which were established again after being dismantled and confiscated on 09 April 2018. They confiscated desks and chairs and left in the area a list of the confiscated property. The school shelters around 23 students. On Friday, 13 April 2018, a group of Israeli settlers set fire to al-Shaiekh Sa’ada Mosque (Abu Shaher) in ‘Aqraba village, southeast of Nablus. The Israeli settlers poured a flammable material inside the mosque and then set fire. The mosque entrance, 2 water coolers, and electrical switches caught fire before a number of civilians managed to extinguish it. The Israeli settlers also wrote hostile slogans in Hebrew against Arabs and Muslims. On Friday, a group of Israeli settlers from “ Itmar“ settlement damaged around 7 olive trees in Khilet Rajeah, northeast of Rujeeb village, southeast of Nablus. These trees belong to the heirs of Rajeh Darwish Dowikat. The settlers also damaged a water well, retaining wall, and fence. At approximately 10:00 on Saturday, 14 March 2018, a group of Israeli settlers from “Havat Ma’on“ settlement established in Palestinian civilians’ lands, east of Yatta, south of Hebron, attacked Palestinians houses in Kherbit al-Tawanah with stones. A force of Israeli soldiers arrived at Kherbit al-Tawanah, prevented Palestinian civilians from moving, and closed all its entrances. The Israeli settlers later withdrew and no more casualties were reported. “At approximately 02:30 on Tuesday, 17 April 2018, I was in my house near the Old Mosque in the center of al-Laban al-Shariqiyah village, south of Nablus. Meanwhile, I woke up to the sound of tires exploding under my house. I immediately got up from my bed and went to the southern balcony of the house, overlooking the mosque and its yard. I saw three masked persons, one of them carying a military bag on his back and wearing military uniform while the two others wearing civilian clothes. After that, one of the abovementioned persons punctured my vehicle’s tires while another one was standing at the mosque entrance. In the meantime, I immediately knew that they were settlers, so I went to my son’s room, woke him up and then we got out of our house. We chased the settler after they punctured my 2 vehicles’ tiers and wrote slogans on my house walls. I chased them for fear of setting fire to the mosque because they set fire to it in 2011. We chased them until they left the village, but after they punctured around 26 vehicles’ tires and wrote hostile slogans on it.” PCHR keeps the names of persons, whose vehicles were attacked. On Wednesday, 18 April 2018, a group of Israeli settlers from “Yitzhar” settlement, east of ‘Orif village, south of Nablus attacked a plot of land belonging to Najeh Abdullah Deib Shehada in al-Safafeer area, 2 kilo meters away from the settlement. The settlers damaged about 10 olive trees, 10 almond trees, and 3 grape vineyards, which were planted 2 years ago. They also attacked a plot of land belonging to Raied Mahmoud Sabbah and cut off 4 olive trees and 2 almond trees, which were planted 6 years ago. The Israeli settler wrote in Hebrew “Death to the Arabs” on a container built of tin plates in a plot of land belonging to Moayed Shehada and later withdrew.